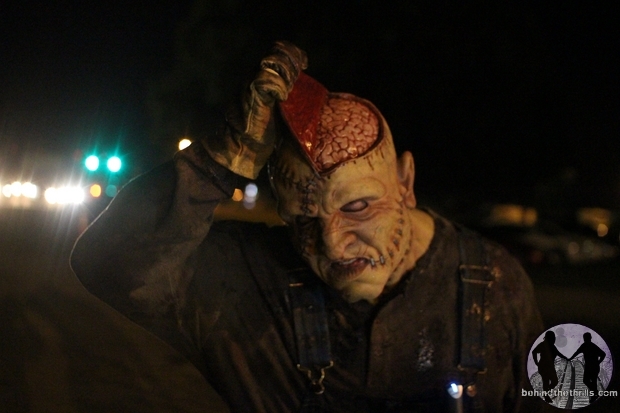 The Shallow Grave in Winter Haven Florida goes down as one of our favorite haunted attractions of 2014. It was a simple concept, done extremely well, and without limits and boundaries. We are excited as hell to say that The Shallow Grave will be back for Valentine’s Weekend. It’s a new trend that has been developing for a few years now, but haunts are opening for a quick scare during a time when it’s mostly about love and relationships…which can be scary in their own right. It may also be the last time you can see one of the two signature haunted houses in it’s current form. The Shallow Grave is an independently owned haunted attraction. We first visited in 2014, and were just blown away by everything the attraction did. They created two separate haunted houses, Haunted Hills and ADHD. They created their own boogey man with Thaddeus. He’s a big hulk of a man, who keeps himself and his family alive by eating the flesh of the dead. If you see Thaddeus, that’s usually the end of you. He came from the Great Depression, and his only option to feed his family was to do what he had to. The flesh made him crazy, and the souls of his victims still haunt the homestead. 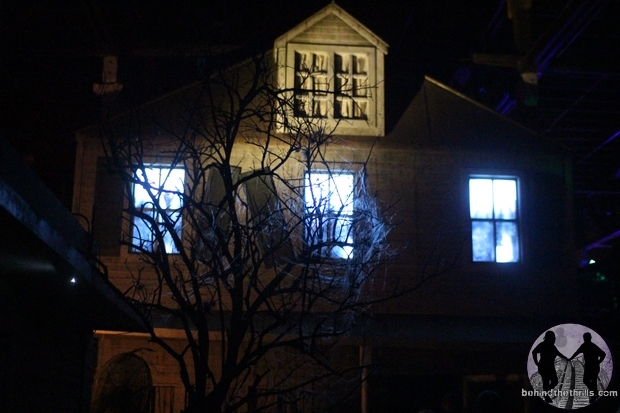 Haunted Hills is the oldest of the two houses, and is a great attraction. It could also be on it’s way out. Post by The Shallow Grave. Will we see a new haunt in 2015? Or are they scrapping it? Whatever the case may be, Valentine’s Day Weekend could very well be your last chance to experience it. While it doesn’t seem to be a good date, at first, if you think about it, there’s something very romantic about going to a haunted attraction on Valentine’s Day with the one you love. The fear pushes them into your arms, and when you make it out, they’re so grateful to be alive that they’re willing to…umm…show their love. It’s also a fun way to shake up the winter blues. Still, Shallow Grave’s own Haunted Hills stands as a testament to what a good stand alone haunted house could be, as long as you have the right people working it. The house was intense, and could even resort to touching…if the need arose. 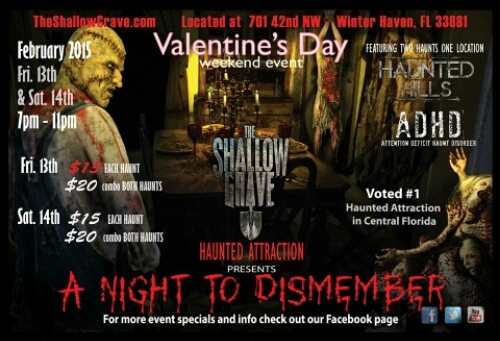 The Shallow Grave will be open for Valentine’s Day on Friday February 13th and Saturday February 14th. The Shallow Grave has released a few more details about the Valentines Day event. Stay tuned for more gory goodness, and be sure to get social with us on Facebook, and follow along with us on Twitter @BehindThrills for the latest updates! For more information about The Shallow Grave, visit the official website by clicking here! Previous PostA Frozen Holiday Wish to make an extended run through first part of January at Magic Kingdom Next PostThe 2015 new attractions guide:What's new in theme parks for the new year? SDCC 2016: Surprise! The Blair Witch project gets a sequel this fall!